Germans are reputed to be a serious and disciplined people. But at least once a year, large parts of the country really let loose. Here is all you need to know about the wildest of all wild German festivals. If you dropped a complete newcomer into one of the German Carnival strongholds, they’d think the whole world had gone completely mad. And they wouldn’t be entirely wrong, either. The streets are filled with enthusiastic narren, “jesters” or “fools” as true Carnival goers are known, decked out in fancy dress as clowns, ghosts and unicorns. Singing and dancing, they parade through the city streets in seemingly endless spectacles, while all the pubs practically burst at the seams. Normal, everyday life is put on hold for a while, leaving the casual observer only one viable option: to join in the fun. Carnival in Germany has many origin stories. It can trace its roots back to a heathen ritual of the Germanic peoples to drive out the ghosts of winter and the ancient Roman festival of Saturnalia where moral restrictions were eased and masters and slaves feasted at the same table. With the spread of Christianity, Carnival became the last chance for people in the Catholic areas of Germany, to really live it up before Lent. 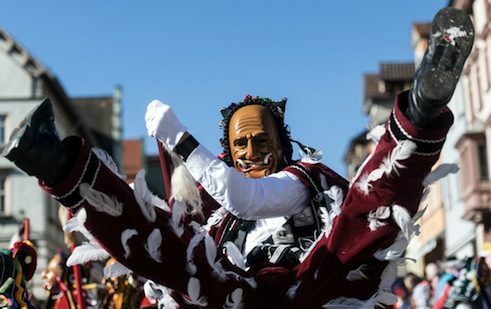 This may also explain how the merrymaking got its name, from the Medieval Latin carne vale or “flesh, farewell!” Depending on the region, Carnival also goes under a few other aliases, such as Fastnacht and Fasching. Today, Carnival is an amalgam of all these traditions: it is a joyous street festival in the biting cold of winter, a revolt against authority and, most of all, an excuse to celebrate and enjoy life to the very fullest. 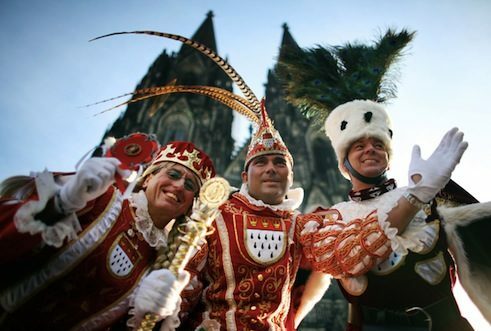 Traditionally Carnival is celebrated with the greatest passion in the Rhineland where cities like Cologne, Dusseldorf and Mainz host massive festivals, and in Southwest Germany, home to Swabian-Alemannic Fastnacht. 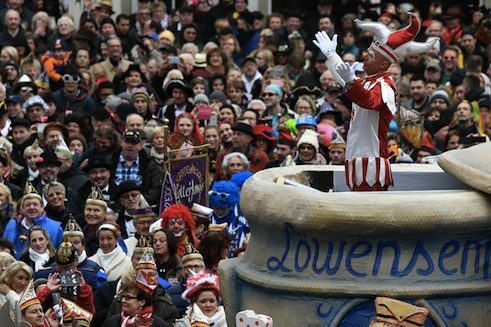 In many other cities from Bavaria to Brandenburg, the yearly event calendar would also seem incomplete without Carnival. The annual festival is so important in some places it is referred to as the “fifth season”. This season of merrymaking begins on November 11 and lasts until the start of Lent seven weeks before Easter. Eleven is the number of the season, which kicks off at 11:11 am on 11/11. 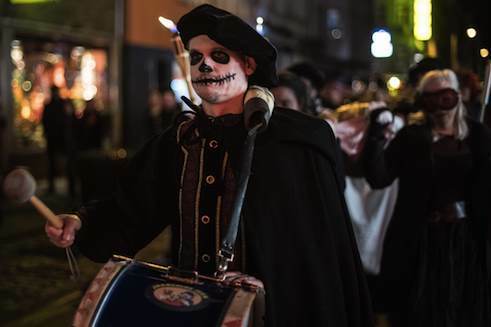 Kicking off Carnival on 11/11 in Cologne’s historical city centre | Photo: © picture alliance / Horst Galuschka / dpa Every year on the 11th of November, huge open-air events signal the start to the new Carnival season. Thus begins the reign of the Carnival princes and princesses, royal couples who rule over the madness until Ash Wednesday. In Cologne, a triumvirate oversees the merrymaking, with a prince, maiden and peasant, all traditionally played by men, who make up to 400 appearances per season. During Carnival, a person in uniform is not an uncommon sight on the streets of the Rhineland. They are most likely a member of a traditional Carnival society corps. 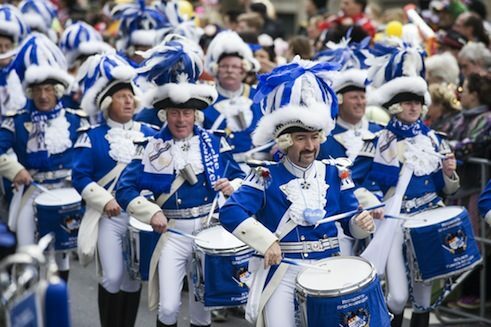 Carnival associations were first founded at the beginning of the 19th century in Cologne, and their uniforms were based on those worn by Napoleon’s troops who occupied the left bank of the Rhine River from 1801-1813. Similar uniforms are still worn today to poke fun at military discipline. Cologne is also home to a gay Carnival corps, the Rosa Funken. 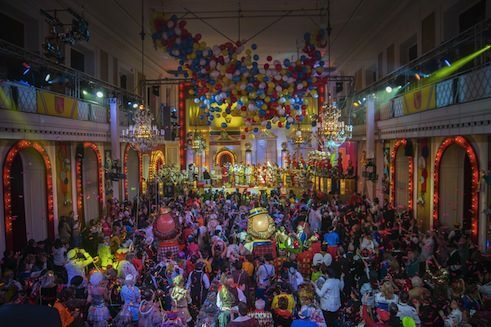 Carnival associations host huge Carnival meetings throughout the season, with some even broadcast live on national television. Local bands play – in the greater Cologne area alone, literally hundreds of bands perform all kinds of musical genres in the local dialect – and the Büttenredner hold cutting satirical and political speeches. The tradition of the “simple man” criticising authority with no fear of reprisal during Carnival goes all the way back to the Middle Ages, and most meetings still take great pleasure in making fun of politics and its leaders today. All narren and jecken look forward to the highpoint of Carnival: the street festival held in February in the six days leading up to Lent. Under different regional names such as Weiberfastnacht and Altweiber (Crones’ Carnival), the streets fill with revellers as the outdoor celebrations begin on Fat Thursday and last until Ash Wednesday. This is the day women seize power, and men on the streets, at work and in street cars are well advised to take care. Anyone wearing a tie runs the risk of finding himself suddenly surrounded by the group of celebrating women with a pair of scissors handy to snip it right off. At exactly 11:11 am, women storm the head offices, and everyone downs tools to take part in the festivities. In many cities, the mayor symbolically relinquishes power to the people at 11:11 am by handing the keys to the town hall over to either a group of women or the local Carnival association – but only for the next six days. During the entire season, Carnival societies organize huge meetings with music, amusing and often political speeches, and performances by dance troupes and clubs. 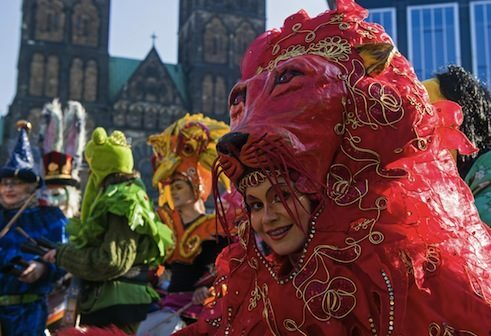 All the Carnival associations in Mainz come together to host the city’s largest meeting called “Mainz bleibt Mainz, wie es singt und lacht” (Singing and laughing, Mainz remains Mainz). The event has been broadcast on national television since 1973. In Cologne a group of three, the prince, the maiden and the peasant, serve as official regents who rule over merrymakers during Carnival. All are traditionally played by men nominated by the Carnival societies each year and only serve for one season. The triumvirate kicks off the street festival on Weiberfastnacht, Fat Thursday, at 11:11 am. The big Carnival societies have a funken corps that encompasses dancers, musicians and sometimes even riders. The funke is a traditional figure at Carnival, generally clad a uniform inspired by those worn by Napoleon’s troops to mock everything military. They play to the crowd by forming a stippenföttche where two corps stand back to back and rub bottoms. 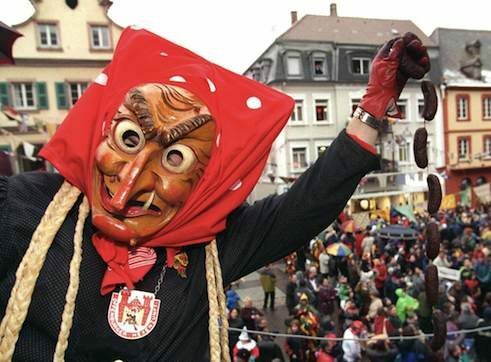 At Swabian-Alemannic Fastnacht, costumed participants known as narrenhästräger wear expressive masks generally made of wood and called either “larvae” or “spectres”. The masks represent typical local characters and legendary creatures, and are often passed down from generation to generation. In Mainz it wouldn’t be Carnival without the famed, giant schwellköpp. These round, papier-mâché heads weigh around 25 kilogrammes and are modelled after well-known Mainz luminaries. They can be seen at important events and are carried through the streets on Rose Monday. Around 30 people have been immortalised in papier-mâché since 1927. 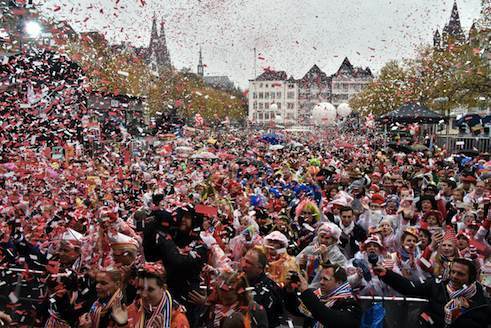 After Cologne and Mainz, Dusseldorf hosts the third largest Rose Monday parade in Germany. Jacques Tilly has made a name for himself building topical floats that feature jeering political satire. 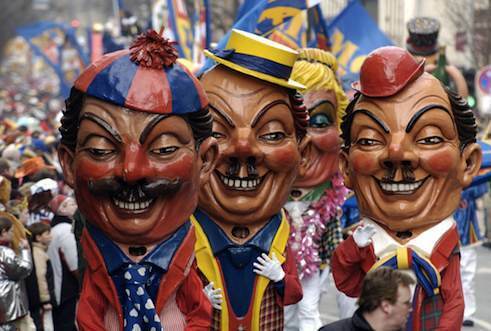 Rottweil’s Narrensprung is one of the best-known Swabian-Alemannic Fastnacht parades. Over the course of two days, around 4,000 masked figures march through the city’s historical centre. Unlike parades in other cities, only members of the local “jester’s guild” can march in the parade. While scantily clad Samba dancers are rarity at most German Carnival celebrations, attractive dancers are most decidedly not. The Carnival societies nominate their Dancing Maries, who thrill audiences with their acrobatic feats. A dance officer carries ‘his’ Marie though the streets, pausing often to toss her high into the air. In Munich Fasching is more indoors than out, with huge, elegant Fasching balls held in large halls. The Dance of the Market Women marks the close of the festivities at Viktualienmarkt, a large marketplace in the historic city centre, where women don self-made frocks and take to the floor in the last dance of the season. 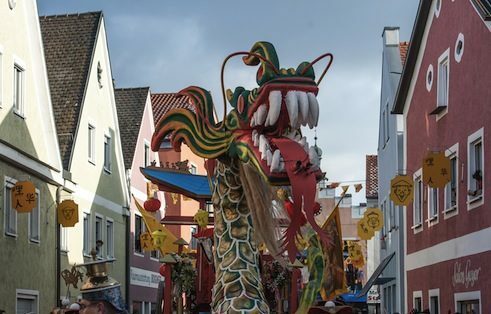 In the Bavarian town of Dietfurt, the Fasching parade has had a Far-East flair since the 1950s. Local legend has it that in the Middle Ages, a tax collector attempting to part the people of Dietfurt from their hard earned money for the Bishop of Eichstätt disparagingly called them “Chinese” because they hid behind the town wall, their own “Great Wall”. On “Nonsense Thursday”, the Thursday before Ash Wednesday, Dietfurt transforms into “Bavarian China” and crowns an emperor. The call of clowns awakens the “Bavarian Chinese” at 2:00 in the morning, entreating them to come and watch the Bavarian Chinese parade of around 50 groups, including the Emperor’s Chinese steam bath and the Bavarian-Chinese national football team. While Protestant-leaning North Germany is not known for its extravagant Carnival celebrations, the people of Bremen go all in with a distinct Brazilian flair – all in the chill of mid-February. Bremen has hosted Europe’s largest Samba festival, which attracts around 35,000 visitors, since 1986. Cologne’s Ghost Parade goes back to 1991 when all the Rose Monday festivities were cancelled because of the Second Gulf War. In response, political activists joined forces with Carnival goers and marched through the city in an anti-war demonstration. The Ghost Parade has been held on Carnival Saturday every year ever since to address a current political issue. Anyone dressed as a ghost or ghoul is welcome to join the parade with its slight anarchistic air. Many ghosts carry signs or design their costumes to protest the political issue of their choosing. No self-respecting Carnival goer would dare attend the street festival without a costume, a wonderful chance to slip into a different role for a full six days. The only limitation to revellers’ creativity is the weather. A costume has to keep out the winter chill, but not be too thick for fun in the bars and clubs. This is not an easy balance to strike, so many merrymakers have more than one costume and some even boast an entire closet full. Swabian-Alemannic Fastnacht differs a bit from the revelries in Cologne. Scary creatures rule now as devils, legendary figures, witches and the “wild people” chase away the last vestiges of winter. Most costumes involve a very detailed mask, usually made of wood. Here the costumed revellers are called narrenhästräger and wear the same costume every year. During the street festival, downtowns throughout Germany fill with brightly coloured parades. Every village and ward holds their own parade where marching bands, dance groups, Carnival societies, neighbourhood clubs and schools put on fancy dress and either march on foot or travel in style on specially constructed floats. Children’s eyes light up as the parade passes by and participants toss out candy. Some even fling flowers and stuffed animals into the crowds. 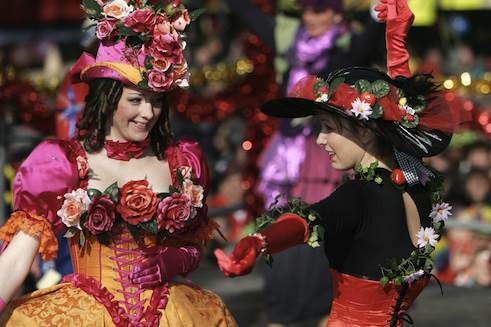 The largest and best-known parades take place on Rose Monday in Cologne, Dusseldorf and Mainz. Up to 100 groups take to the streets in a spectacle that spans many kilometres and takes up the entire day. Rose Monday parades are not just a chance to let your hair down through. 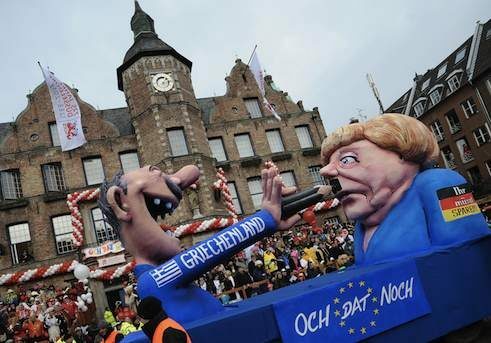 In Dusseldorf in particular, the floats are known for their biting satire, and Cologne and Mainz parades also critically reflect on politics and society. Around one million visitors line the route of the Rose Monday parade in Cologne each year and grab the many tons of sweets that fly through the air. Although Rose Monday is not an official bank holiday, many companies give employees the day off. 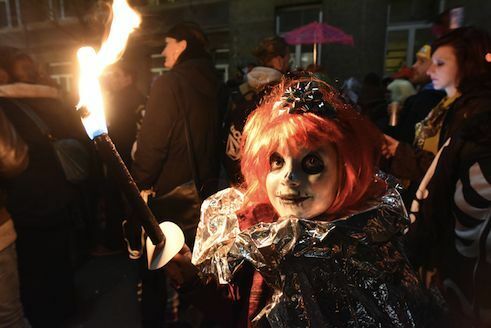 Burning the Nubbel in Cologne | Photo: © picture alliance / Federico Gambarini / dpa Carnival is not always a fun mix of colourful characters. In the town of Blankenheim in the Eifel, Saturday night belongs to the ghosts, monsters and ghouls. In Cologne too, the dark creatures of the Jeisterzoch, the local ghost parades, strike fear in the hearts of passers-by. Anyone can join in as long as they’re wearing the proper costume. So on Carnival Saturday, the night is filled with skeletons and ghosts accompanied by fire eaters and drum corps. The last evening of Carnival is often a more sombre affair as well. With Ash Wednesday just around the corner, the excesses of Carnival need to be forgiven and forgotten. A straw man called the Nubbel serves as a scapegoat and is burned on Tuesday night outside the Cologne bars. The ceremony harkens back to the Middle Ages with priests, monks and hangmen in attendance to sit in judgement of the Nubbel, who is found guilty of all the shameful acts committed in the recent past. The slate is wiped clean as the straw man is consumed by the flames, which mark the end of Carnival and usher in Ash Wednesday. Eva-Maria Verfürth is the founder and editor-in-chief of the Tea after Twelve online magazine and managing director of the Bunny Island communications agency.